India loses agriculture produce worth several hundred crores of rupees every year to weeds. While removing weeds manually is laborious, use of chemicals to destroy them is hazardous to environment and crops. 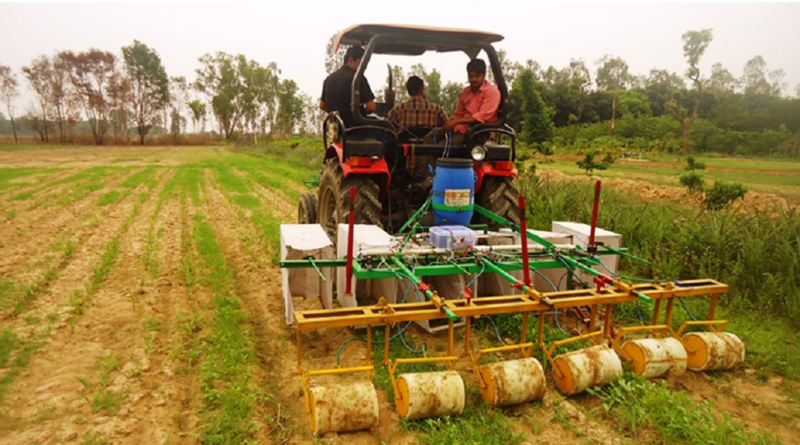 A group of Indian and American researchers have developed a weed removal device for precise application of herbicide that can reduce crop damage and contamination. The tractor-mounted device releases precise amount of herbicide after sensing weed density through image analysis. Amount of herbicide varies for every 5 per cent change in weed infestation unlike the conventional system that uses same amount of chemical on a given plot. The device has been developed for crops with row-to-row spacing of 350-450 millimeters. Field experiments on dryland with groundnut and maize crops have shown that the use of the device increased production, reduced crop damage and also saved around 80 per cent of the herbicide as compared to conventional systems of herbicide use. While contact-type weed eradicators have been developed in the past, this device introduces variability to the dose of herbicide in proportion to weed density. The apparatus includes a storage tank, pipelines, cameras, deflectors, ground wheel and sponge rollers, all connected to the back of a tractor moving at a speed of 2.1 km per hour. The processing unit consists of a laptop with digital image analyser application. The herbicide can be applied simultaneously in six parallel rows which are served by a camera and sponge roller each. The main crop is restricted from field of view of the camera through deflectors so that only weeds appearing between the rows is captured by the cameras and treated with the herbicide thus ensuring minimum crop damage. The device is not yet ready for the market as researchers still need to evaluate the prototype and make its processing unit more robust. “We want to replace the laptop with a small analytical device which will also reduce the cost. The reliability and feasibility of the weed eradicator needs to be tested for other crops as well,” said Chandel. The research team also wants to offer a variant of the device which can be handheld since many farmers can’t afford to use tractors. Can Arbuscular Mycorrhizal fungi reduce the growth of agricultural weeds?